The coastline between Folkestone and Dover contains two internationally important reference sites for stratigraphic studies of the cretaceous period. The formations are important for the vertebrate and invertebrate fossils that they yield. Also, the succession of coastal landslips that has taken place in the Folkestone Warren area is of considerable geological interest. 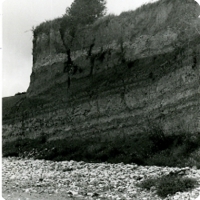 The area of coastal landslides at Folkestone Warren, which includes both chalk and gault, has probably been more extensively studied than any other site of comparable size in Great Britain. The Folkestone beds (Lower Greensand) are also well exposed here on the foreshore in Wear Bay. Dinosaur footprints have recently been found in part of the formation along with evidence of a tidal shoreline. see http://academia.edu/1888387/Dinosaur_Footprints_from_the_Folkestone_Beds_Lower_Greensand_Folkestone for more information.